Samsung is delivering a device with the potential to prove the practicality of a device that can exist completely off the grid. Their “Blue Earth” phone is a touch screen phone with a solar cell on the back, taking up nearly all of the surface area on the back of the device. 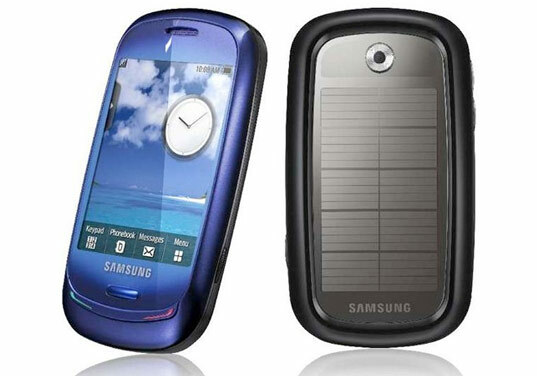 Samsung has really pushed the “green” theme far on this one. If the name isn’t enough, there’s also a calculator that will help you figure out what quanitity of resources you’ve conserved through your actions. Beyond superficial names and questionably gimicky applications, Samsung has made a serious step toward conservation by making the phone’s casing out of recycled plastic bottles, and they ship the phone in completely recycled paper packaging. I hope that this concept doesn’t die with this model. I’d love to see effitient solar panels popping up on the backs of all sorts of devices. (Can I get one on a laptop lid please?) It’d be great to be able to set my phone face-down on the table on a coffee shop patio and get a little charge boost. 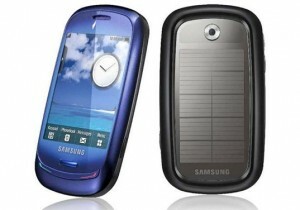 The Samsung Blue Earth phone will be shown February 16th at the Mobile World Congress in Barcelona.